Vibe on the street: bohemian, fashionable, with a vibrant atmosphere and real mix of residents. Famous for: lots of bars, trendy hang-outs and lively piazzas. One of the best-known shopping streets, Via Nazionale, and some cultural attractions. If Rome were to have an It neighbourhood, all hands would point to Monti. A recently gentrified area, Monti has been living off its 21st-century renaissance reputation for the last few years. Back in the day, and we mean Caesars day, Monti was the Suburra, an overcrowded, low-class hood, whose bad boy attitude it proudly maintained until a turn-of-the century revival. Now Monti has transformed, or better yet, gentrified, into an all-ages hipster hang out. Charming cobblestone streets and picturesque palazzi are the perfect accompaniment to Montis traditional and trendy bars, restaurants, shops and hangouts. 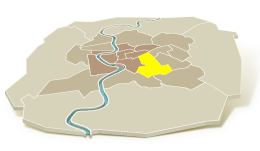 The defined area is the slope from the Quirinal hill to the Roman Forum, and includes adjacent Oppio and Celio hills, as well as part of the Esquiline. Think of the area as a lazy rectangle with Via dei Serpenti/Via del Fagutale and Via Merulana as its lengths, and Via Nazionale and Via dellAmba Aradam as its widths. The heart of the neighbourhood is the intersection of Via dei Serpenti and Via Leonina/Via Urbana, and Piazza della Madonna dei Monti. These crossroads, along with Cavour metro stop should be your reference points as you navigate to and from the area. Neighbouring areas include Ancient City dominated by the traces of Ancient Rome including Roman Forum and Coliseum, and Esquiline where Termini Station is located. Everyone wants to continue labeling Monti a real Roman neighbourhood but the truth is the neighbourhood is mix of local families, students and roustabouts with gangs of ex-pats. Its not uncommon to hear some English with a little romanaccio (Roman slang). With both Via Cavour and Via Nazionale running through the neighbourhood, Monti gets a lot of traffic from locals, businesses, tourists, and often protestors. Expect Monti to be buzzing with people during demonstrations and strikes, either stragglers coming in to the piazzas or residents just hanging out. Consider it to be local thoroughfare and for that, expect a lot of life in Monti. The Monti area has a range of shopping from pharmacies and food stores to fashion and artisan boutiques. In the heart of the neighbourhood, Via Urbana and Via del Boschetto are the go-to streets for finding practically anything - one-of-a-kind gifts, new and vintage clothing, household goods, shoe repair, bakeries and a prestigious mosaic designer. Likewise, the surrounding side streets offer up everything from bric-a-brac to chic bio markets. For more standard shopping Via Nazionale is lined with Italian and international brands such Bata, Benetton, Etam and Blue Sand. Via Nazionale also has a large bookstore and Castroni, the slightly costly international market with familiar British, American and other items like marmite, peanut butter and Japanese rice. If local artisan is more to your interests, Via di San Giovanni in Laterano (closer to the Coliseum) has a new crop of unique boutiques. Getting to and from Monti is very easy and convenient. Several buses run through and around the neighbourhood including 40, 64, 75, 81 and 117. These buses connect Monti with the Vatican (40, 64, 81), Centro (40, 64, 81, 117), Testaccio/Trastevere/Gianicolo (75), Piazza del Popolo (117) and Termini Station (40, 64, 75). In addition, Monti is fully equipped with Metro stops Cavour and Colosseo which link the area to Termini Train Station, as well as all other stops on the Blue Line (B). Not surprisingly, Monti is also within easy walking distance from the historic centre and Ancient Rome. Monti is a cultural crossroads. The neighborhood is surrounded by contemporary galleries and museums, along with ancient monuments. More interesting is its recent evolution as a mecca for foodies for its great restaurants and food shops. Its the life of the party with its bars and vibrant piazza life. The Monti must do list includes the Coliseum and the Imperial Forums - whether walking into its museum and subsequently 2nd-century offices/market place, or enjoying a free peek at Trajans column and basilica. On the north western edge of the neighborhood is the Palazzo degli Esposizoni, an exhibition space for blockbuster contemporary shows while nearby Via Panisperna has several small art galleries. On the southeastern end of the area (and near the Coliseum) is the Church of San Clemente, a favorite underground site for archaeology lovers - its a church built atop a church built atop a 1st-century Roman house. Almost hidden in the center of this area is the Church of St. Peter in Chains (San Pietro in Vincoli) with an outstanding sculptural grouping by Michelangelo. Lately, Monti has become a focal point for foodies whether searching for panini (sandwiches), pizza or traditional dishes. Top-ranked local favorites include Trattoria Monti, La Carbonara and Taverna dei Fori Imperiali for Roman cuisine and Alle Carrette for pizza, but it is hard to truly list the best restaurants in Monti. Thats why Rome has food bloggers, a prolific bunch of individuals always out to let you know whats best to eat in Rome and in particular Monti. For in-depth assessments and current listings on Montis food scene, look at ParlaFood and Elizabeth Minchilli. Everyone wants to hang out in Monti, whether sunshine or moonlight. And the vibe is much the same regardless of the time of day. Nightlife in Monti means bars and hang outs like Ai Tre Scalini, a rustic and often overcrowded wine bar, Urban47, a hipster wine bar/restaurant and Piazza della Madonna dei Monti - yes, people just hang out in the piazza. New entry to the scene is Caffe Propaganda, on the other end of the area, more chic than cheap restaurant and bar. Nighttime-only venues include Charity Café, a live jazz club and Casa Clementina, a home-inspired evening hang out spot.